cairnswk wrote: drunk eh? well, no use arguing with someone who is drunk. cairnswk wrote: as stated initially it was written as MockBa but using the Kremlin (not Cyrillic)font, so in fact it is correct as it is. if you can use Kremlin, ok. but in Kremlin you wrote Moskba. becasue as I wrote, Kremlin has order A, B, C, D. so maybe better will be to use Kremlin´s "v", which is behind "u" in order. cairnswk wrote: you are welcome to post suggestions anytime. I agree with Oneye about the title. I don't know the font you're using, but does it have a normal looking M that you could use? The M you're sing is an up-side down Shcha. And the name is spelled with a V not a B, so it should read "Moskva". It's just that the Cyrillic V looks like the Latin B.
tokle wrote: I agree with Oneye about the title. I don't know the font you're using, but does it have a normal looking M that you could use? The M you're sing is an up-side down Shcha. 1. the title has been changed to MockBa in Kremlin font...i fon't think the "up-side down Shcha" is out of place except to those who are trying to read this in Cyrillic? 3. the bridges have been altered and more stylised. This is a stupid thing to argue about right now. Graphics are next and it may all change. I am drunk now, to be honest totaly drunk,but what is stupid about care to have somethig corect? It is not stupid to care about something, but stupid to argue over something that may change in the graphics part of the foundry. As for the title myself, here are my thoughts on it. Mockba, no matter how it is spelt or written, will not be recognised by 99% of conquer club players. 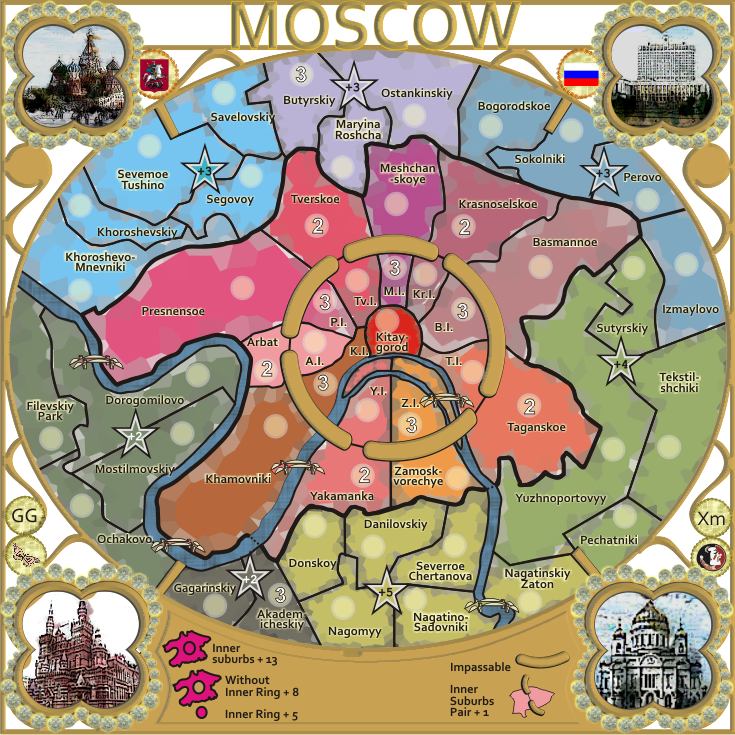 Moscow or Moskva are far more recognisable and like the current title, are correct. While these may be the English name and spelling for the city, they are correct. Another point for these two is that the rest of the map is in English. And before anyone says this is a stupid point as I have my maps (Magyarország) in Hungarian, this is completely different. Out of the three titles here, the two English spellings have many points over Mockba, that it would be appropriate to have one of them instead. English spelling that is recognisable by all players. Browse games/start a game pages, it will be written correctly. English spelling that is recognisable by most players. 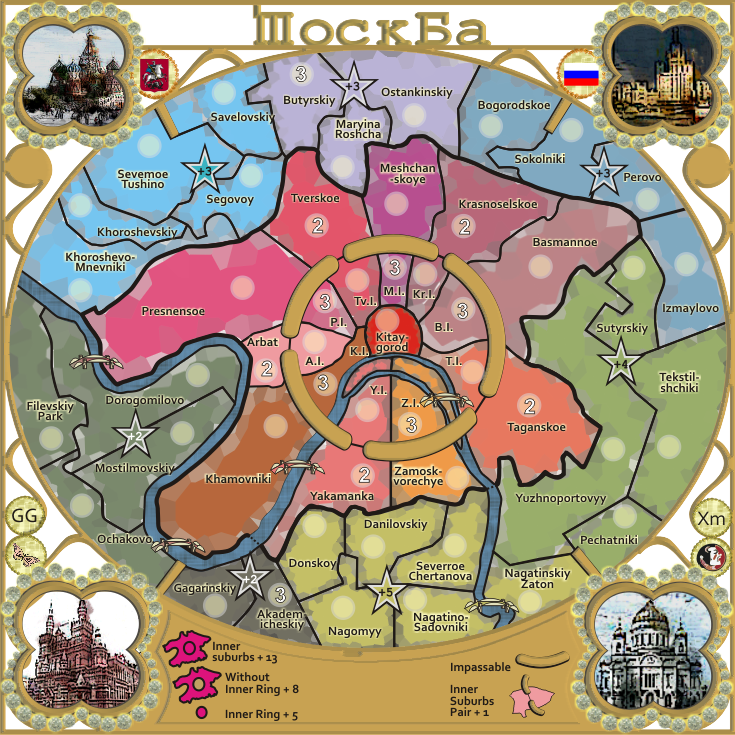 I cannot see any reason why this map would be called Mockba apart from if the map maker wishes it to be called that. As for the back and forth over the title, do not push your ideas onto someone Oneyed whether drunk or not. Make a suggestion, if it is not picked up, so what, you have done what you feel would help the map, but in the end that is all you can do when it is not your map. koontz1973 wrote: It is not stupid to care about something, but stupid to argue over something that may change in the graphics part of the foundry. 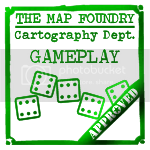 I found that graphics is discused all time of map development to the point when map has Graphics stamp. koontz1973 wrote: Mockba, no matter how it is spelt or written, will not be recognised by 99% of conquer club players. koontz1973 wrote: Moscow or Moskva are far more recognisable and like the current title, are correct. While these may be the English name and spelling for the city, they are correct. Another point for these two is that the rest of the map is in English. And before anyone says this is a stupid point as I have my maps (Magyarország) in Hungarian, this is completely different. what is different to have map in Hungarian and Russian? yes, if title will be in English there would be no problem with spelling. did you count also Serbs? Greeks? Ukrainians? or other people from what was USSR? koontz1973 wrote: do not push your ideas onto someone Oneyed whether drunk or not. Make a suggestion, if it is not picked up, so what, you have done what you feel would help the map, but in the end that is all you can do when it is not your map. koontz, I found you as very helpfull man in the foundry, but sometimes you ignore history. cairnswk, my last notice for title. I see that you change rest of font in the map. why not to use Cyrilic for title, Kremlin is now also different from the rest of text. to be honest, I like how you used Kremlin in the rest of the map and I understand that you can have something what looks like Cyrilic, but is readable. OK decision made...sorry Oneyed and tokle...but the title will be changed back to Mosocw and in the Corbel font. not more arguing...all in English. period. I don't have a problem with it being in English. I was just saying that if you were writing it in cyrillic you should have it written correctly. If you're not able to do that, then it's better like it is now. tokle wrote: I don't have a problem with it being in English. I was just saying that if you were writing it in cyrillic you should have it written correctly. If you're not able to do that, then it's better like it is now. Carrying on with the title (nice to see Moscow ) and frame effect, it might be nice if the title was a tad smaller with bars running up and down to hold it in place. Similar to Rail Asia but a lot smaller. Painting top right does not sit will with the other 3 but that might be as it is a lot darker than the others. koontz1973 wrote: Carrying on with the title (nice to see Moscow ) and frame effect, it might be nice if the title was a tad smaller with bars running up and down to hold it in place. Similar to Rail Asia but a lot smaller. OK, but can you get the title to sit on the frame, so make it a tad bigger. With the bevels added, it should stand out enough from the frame to be able to be read. i've moved to sit atop the frame and it is a tad bigger...but it is legible as far as i can tell...so doing this has nothing to do making it more legible. Those new bridges are sweet. nolefan5311 wrote: Those new bridges are sweet. Just thought I would pop in and see. Here is a short list for you to look at but I am sure you already know these. This is the area that I thought was great and needed copying all around. Yes, and i had already changed that in the Outer Khamovniki territory and asked for feedback a couple of posts back. Still waiting for a reply from koontz1973 on this one :! 2. image top right replaced. I think it was good decision to make all map in English. the bridges look nice, but I think the map is from modern era and they look as stone/wood bridges. maybe something modern or any of Moscow bridges should be better? Oneyed wrote: I think it was good decision to make all map in English. Oneyed...i looked at all the bridges in Moscow and i think what i have represents a stylized version of bridges. Most of the bridges have some sort of arch under or over the bridge and it is difficult to make one particular bridge "fit all"...so i am happy with what i have. Thank-you for the idea though. We'll go ahead and get this one moved up to Graphics. nolefan5311 wrote: We'll go ahead and get this one moved up to Graphics. Is iancanton happy with this gameplay before i start on graphics re-arrangement? I assume so. He hasn't posted with any concerns. nolefan5311 wrote: I assume so. He hasn't posted with any concerns. Ah, assume? Can we get some clarification that he is happy with gameplay please...before moving this...i don't really want to be premature with it and have to do some stuff again. Thanks for your help though. I've pm'ed him about it and posted in the CA forums that I was getting ready to stamp it. You can PM him yourself and let him know you're not ready to move on to the next stage until you hear from him though. There's not really much more I can do. nolefan5311 wrote: I've pm'ed him about it and posted in the CA forums that I was getting ready to stamp it. You can PM him yourself and let him know you're not ready to move on to the next stage until you hear from him though. There's not really much more I can do. cairnswk, these areas are now good in my opinion but you do need to polish them all up.